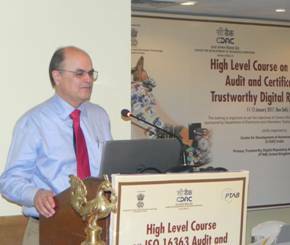 The first ever High Level 3-day Training Course on ISO 16363 for Auditors and Managers of Digital Repositories was successfully conducted during 11-13 January 2017 at India Habitat Centre, New Delhi, India. This training was organized as per the deliverables of Centre of Excellence for Digital Preservation by Human-Centred Design & Computing Group, C-DAC Pune in collaboration with PTAB UK. The Centre of Excellence for Digital Preservation iss a project sponsored by Department of Electronics & Information Technology, Government of India. The efforts of HCDC Group has helped in introducing the ISO 16363 and ISO 16919 through the National Accreditation Board for Certification Bodies (NABCB). The first batch of potential technical auditor has been trained which included 27 Participants from various stakeholder organizations like Certifying Authority, STQC, Quality Council of India, NRSC / ISRO, National Archive of India, RBI Archive, IGNCA, Prasar Bharati, NIFT, IRCLASS Systems and Solutions, C-DAC Pune and Noida, etc.